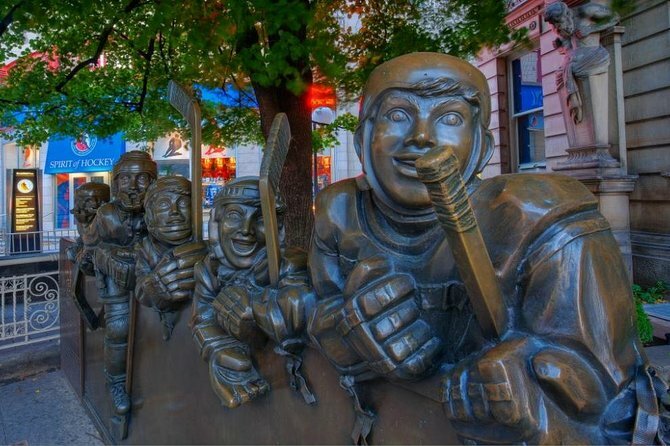 The Hockey Hall of Fame is located in the heart of downtown Toronto at the corner of Yonge & Front Streets in Brookfield Place, a short walk from many Toronto attractions including Scotiabank Arena (formerly Air Canada Centre), CN Tower, Ripley's Aquarium, Rogers Centre and Eaton Centre. Although the average visit to the Hockey Hall of Fame is 2 hours, your admission is for the whole day. You'll receive a hand stamp, and you can leave and re-enter as many times as you want (for example, to grab lunch or visit another attraction). Many people spend an entire day with us, or combine a visit to the Hockey Hall of Fame with a sporting event or visit to the theatre). Wheelchairs and Strollers can reach every area in the Hockey Hall of Fame.